I have combination skin and I was reluctant to try Shea butter because I thought it was too heavy. This stuff is amazing! You need a very small amount so it last forever. It soaks in quick and it makes your skin super soft. I love this moisturizer. I’m in my 30s and I love the nurishing benefits of rose and rose hip oil. Beautiful moisturiser and amazingly non-greasy for a Shea butter cream. Only a very small amount needed to hydrate skin on face and neck and also great that it can be used as an eye cream too! I love the delicate rose aroma! This moisturizer helped my skin survive one of our driest winters. As my skin is naturally more dry, I had to use a bit more than suggested to keep my skin feeling hydrated. But now that the cold weather is gone, I just use a tiny bit of this cream under my eyes and forehead. My skin looks very hydrated and those fine lines are less noticeable. Great moisturizer love the fact that it dosen’t feel heavy on the contrary feels ligth , my skin feels soft and hydrated . I love it’s simple formula with two beautiful ingredients . I highly recomended! Love this moisturizer! Smells and feels amazing. Leaves my skin feeling soft and hydrated all day, especially all winter when you need it most. Like all of Helena’s product, this is amazing!! I love how my skin feels and looks using this moisturizer! Thank you Helena! No more flaky, dry skin patches and as a bonus the smell is fabulous! I can’t believe how little I need of this moisturizer for how effective it is, yet it doesn’t sit heavily on the skin at all, it’s easily absorbed. Hands down the best moisturiser I have ever used…and I have tried everything. Have had several people comment on how nice my skin looks since I started using it 6 mths ago. Bonus is that the scent is amazing! Also received a sample of the calendula and chamomile sun cream with it and it is fantastic. I love that all HL products are so natural and work so well! 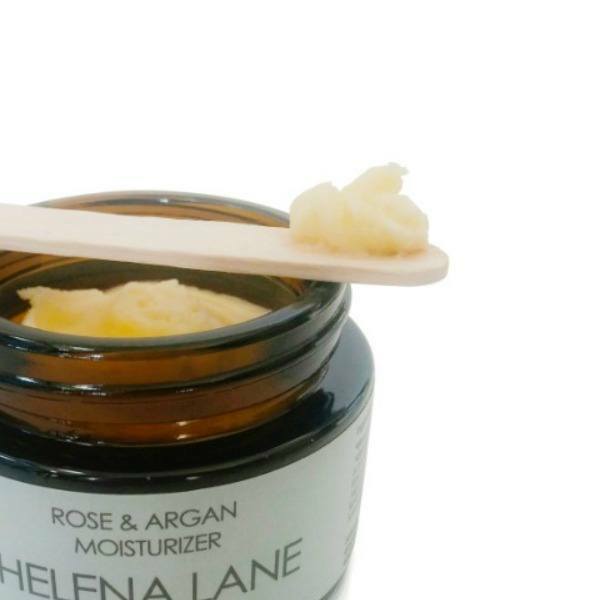 Another incredible Helena Lane product! I love the smell and texture of this moisturizer. Any areas I find a little dry, this product does the job! Only the smallest amount is needed and the skin absorbs it immediately! Have been using this moisturizer for about a month and am loving it! I have dry, aging skin and this is working better than anything I’ve used before. This moisturizer is very soothing on my skin. In the morning after using the hibiscus and hyaloronic water serum, I use a pea size amount,rub it on my fingers until it melts and then pat it gently on my face and let it sink in for half an hour or so before applying my makeup.